Aggregame Blog: New AggreTweet Feature - Filter Top-10! It came to our attention that given the overwhelming popularity of the Nintendo Wii, Xbox 360, PS3, and newly announced Kinect, the list of Gaming Trends on the front page of AggreTweet has become a little... crowded. Since those 4 platforms were always occupying the top 4 slots in the list, it only allowed for a maximum of 6 games to trend. Once you toss a few events into the mix (like E3) which are sure to trend high for weeks on end, it starts to get a little out of hand - and functionally useless. So we've today launched an "Options" link above the Gaming Trends which can be clicked. In it, you'll find 5 convenient check boxes which can be used to specifically filter out which topic types you want displayed (pictured left). This feature only affects the trend graphs, it does NOT affect the actual results that will be displayed in the Live Feed. You'll still see all the topics flowing in as you'd expect. The proper way to filter down the Live Feed is to go to a specific Topic channel (to see only tweets for that topic). 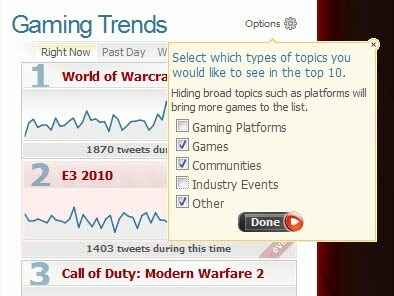 As the site continues to grow, and Twitter becomes more widely used, we'll continue to design useful features to make tracking your video game conversations and trends that much more useful!